Terrible timing: Don’t buy a new laptop, smartphone, or other device without checking if your choice is about to be replaced by an upgrade. You’ll want either the new features or the price drop on the old model. Incompatibility: Some machines just won’t work together, so also do a little web research to ensure that, say, your new projector can communicate with your old laptop. Going in blind: Don’t walk into a store until you’ve acquainted yourself with current technical specs. If a product catches your eye, use online reviews to check how it performs once out of the shop. Underspending: You don’t want to waste money on useless extras, but you also shouldn’t be such a minimalist that you’ll need to upgrade in a year. Paying today’s price: For a better price, use a tool like TheCamelizer.com or Price.com: They track price changes over time. Often called the Rolls-Royce of alpine sports, Foil has outdone itself with its limited-edition Oro-Amaranto Jackie Chan skis. 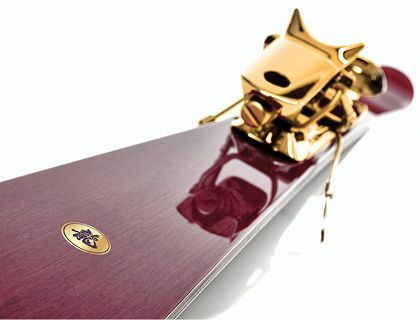 Tuned to the specifications of the veteran action star, who is both a fine skier and a collector of rare woods, these outrageously luxurious foot-extenders have 14-karat-gold-plated bindings and are made from purpleheart, a hardwood prized for its density, water resistance, and beautiful color. Foil also makes skis from Bog Oak—culled from trees buried in peat bogs and thus preserved for up to 8,000 years. The company is working now to develop a high-performance ski made of solid gold.